Exterior of the new addition of Plemmons Student Union. Freshman Christina Fasanello has a passion for extra-curricular activities and cares about the environment. When she entered the new addition to Plemmons Student Union, she realized how easy Appalachian State University makes it to “preserve our natural resources and be an active member of the Appalachian family,” she said. “With all of the new meeting places, the new addition gives students the opportunity to collaborate and work together to plan events and start new organizations on campus,” the anthropology major said. Togetherness and sustainability are important values at Appalachian, and“our values are reflected in what we build,” Vice Chancellor for Student Development Cindy Wallace said at a recent dedication ceremony for Plemmons Student Union’s new addition. The goal for the building, which opened in January, was to create a space in which students could enhance their relationships and learning experiences and where all felt welcomed and accepted, explained Dave Robertson, director of student programs. “The root word of community is unity, and the student union strives to represent all that is good and wonderful about Appalachian as a dynamic community of scholars and learners engaged in civic discourse, student leadership development and action for a better world,” Robertson said. The $20 million, 58,000-square-foot addition was designed to meet Leadership in Energy and Environmental Design (LEED)® Gold certification. Sustainable features include water-refilling stations, LED lighting and flooring made from recycled tires. 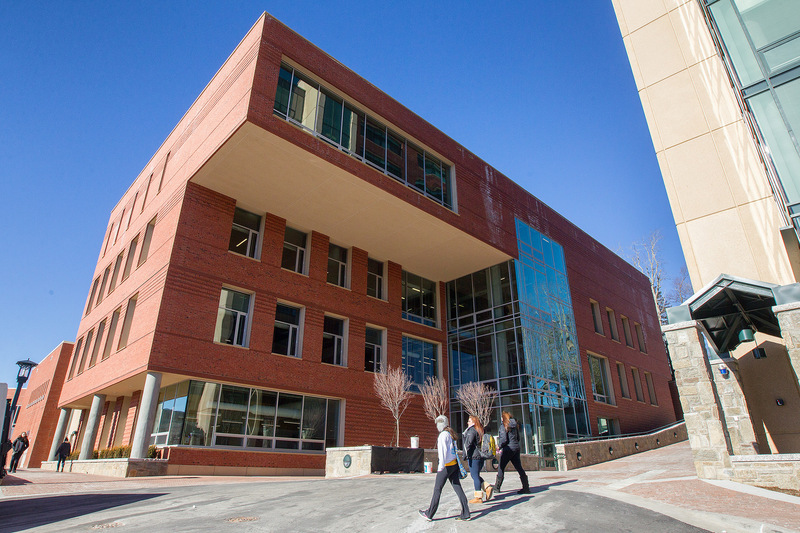 The new addition is part of the university’s master plan to have all new buildings and major renovations meet, at a minimum, LEED® Silver certification, a commitment that began in 2007. With 12 new meeting spaces, the addition has doubled the number of rooms available to students and campus organizations. These rooms, named for local scenic attractions, include Bass Lake Room, Trout Lake Room, Linville Gorge Room, Pisgah Commons and Linville Caverns Room. The Parkway Ballroom serves as the primary event room, with seating for 400 people. The new wing, funded solely by student fees, also has centralized offices that were previously scattered across campus, such as the Office of Student Research, the Office of International Education and Development, the Office of the Dean of Students, Family and Parent Services and the Office of Off-Campus Community Relations. Other offices that have been relocated from their former student union location to the new addition are the Office of Student Conduct, the Appalachian student newspaper , Appalachian and the Community Together (ACT) Outreach Center, Center for Student Involvement and Leadership and Multicultural Student Development. “The addition has become a one-stop shop for students, which is terrific. We have had some students see our sign, walk in and ask what the Office of Student Research is. So, more students are learning about it. That would not have happened where we were located before,” said Dr. Alan Utter, director of the Office of Student Research, located on the second floor of the new addition. Committed to sustainable practices, Appalachian has the nation’s oldest recognized sustainable development and appropriate technology academic programs. This long-term dedication to sustainability is demonstrated across campus from LEED-certified buildings to local food choices offered by Food Services. In 2012, Appalachian was ranked by SIERRA magazine as one of the top 10 “Coolest Schools” for helping solve climate problems and making significant efforts to operate sustainably. The university also was included in The Princeton Review’s 2012 “Guide to 322 Green Colleges,” which highlights institutions demonstrating above-average commitment to sustainability in terms of campus infrastructure, activities and initiatives. The Appalachian and Community Together (ACT) Outreach Center is located on the first floor of the new addition. Eight other offices are also in the addition. This water bottle filling station indicates how many bottles of water have been filled using reusable bottles. Interior of the first floor of the new addition. The Parkway Ballroom serves as the primary event room, with seating for 400 people. Students study in Birch Tree Lounge, one of several new study spaces. Works by professional photographer Katie Langley ’01 are featured throughout the addition. Appalachian has 10 buildings that are either LEED certified, registered or built to LEED standards. Of those, Frank and Mountaineer residence halls have LEED Gold certification.